Among the attendees were Chief Guest Indresh Kumar, Chief Patron of Vishwa Gram (One World One Family) and a large gathering of people from all walks of life. Rich tribute was paid to the former Indian ‘People’s President’ and ‘Missile Man’ Dr A.P.J. 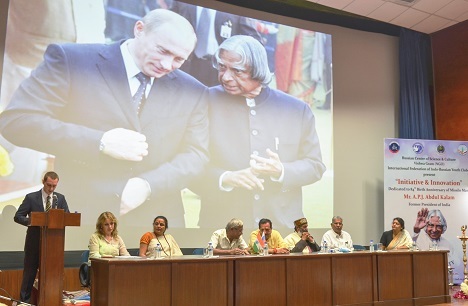 Abdul Kalam at the Russian Centre for Science and Culture on the eve of his 84th birth anniversary. Glowing tributes were paid to Dr. A.P.J. Abdul Kalam, former President of India, by speakers at a function called “Initiative & Innovation.” Organised by the Russian Centre of Science and Culture (RCSC) with ‘Vishwa Gram’ (NGO) and the International Federation of Indo-Russian Youth Clubs (IFIRYC), the function was held on the eve of Dr Kalam’s 84th birth anniversary on October 14, 2015. Among the attendees were Chief Guest Indresh Kumar, Chief Patron of Vishwa Gram (One World One Family) and a large gathering of people from all walks of life. Speakers unanimously hailed the significant contributions of the multi-dimensional personality of Dr. Kalam. Recalling the unique personal, intellectual and professional calibre of Dr. Kalam, Kumar referred to his humanity, simplicity, scientific vision, literary acumen and deep urge for peaceful development of mankind. Essentially a cultural, spiritual and a humane concept, Vishwa Gram looks upon the world as one’s own family, based on the principle of ‘Vasudhaiva Kutumbakam’, propounded by Indian culture. Ajay Singh, former Union Minister, lauded Dr. Kalam as the ‘People’s President’ and the ‘Missile Man’ of India. Prof. A.N.D. Baipai, Vice Chancellor, Himachal Pradesh University, recalled his association with the former Indian President, describing him as a remarkably down-to-earth person, whose clear perspective about the country’s future would remain inspirational for future generations. Welcoming the gathering, Alexander Zhmyrev, Head of Science & Technology, RCSC, said Dr. Kalam held pride of place in the minds and hearts of Russians, and the Russian President, with whom he had an excellent working relationship, highly valued his humanity and scholarship. Paying tribute on behalf of Russian government and people, the Russian Embassy and RCSC, he described Dr Kalam as a great nationalist leader and scientific visionary. Elena Barman, head of the Education Department and Chairperson of Indian Association of Russian Compatriots, while elaborating on activities of Rus-Education in sending Indian students for higher education to Russia, said that from this year, Rus-Education has introduced a scholarship in the name of Dr. Abdul Kalam, for the best Indian student.